What is it really like to be a firefighter? This is a hard movie to review objectively as a firefighter, so I’ll give it a brief review and then follow with my personal thoughts on what it shows. 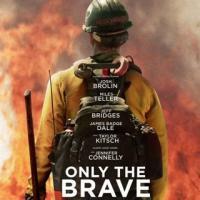 Only The Brave is a dramatised version of the life of the Granite Mountain Hotshots in the lead up to the deaths of 19 of them in the Yarnell Hill Fire in June 2013. If we didn’t know this was a true story, it would be easy to see the underlying dramatic formula here: an outsider needs to redeem himself, struggles to break into the tight knit and macho team, under their charismatic leader the team strives to prove itself, the leader has his own demons to battle with, the contrast between the tough lives of the men and the desire for their wives and partners for them to settle down. It’s the same formula we’ve seen in countless movies before. The story is well paced with the drama saved for the end; in particular, the team’s continued successes in embedding the new recruits, fighting fires and achieving their elite status as hotshots almost leaves you unprepared for the final drama. The filming was great with lots of sweeping scenery; I really liked the broad shots of the landscapes with the small teams of firefighters pitted against both the sheer scale of the land as well as the forces unleashed by fires. The fire effects were done well – realistic depictions of ember attacks, the sense of isolation and disorientation in the heat and smoke, the sudden changes in fire behaviour, back burns as an effective tactic to remove fuel from fires. The only thing missing is a lung full of smoke and steaming eyes! The climax at the end is dramatic without being violent, and surprisingly for an America movie there was no mawkish lingering on the after effects. We see the families in distress and the anguish of the lone survivor, but then we’re left to process it all in our own way. Before the credits, we get to see photos of each of the real men of the hotshots team which was a moving tribute to them as individuals rather than simply characters in the screen. As an Australian, some of the details of the American experience seem strange, such as the politics that pit local towns against the federal government and the different statuses of fire crews. But put them aside and so much about this movie rings true. The first thing that rings true is how our experiences in fires are a world away from our family and working lives. The things we see and do, and our responses to them, are hard to describe and yes, we do have a tendency to band together as an exclusive group. If we are truthful, all of us have probably badly messed up the balance between our families and our firefighting in the same way as the characters in the film. But in the end, when the pager goes off or call comes in we need to be able to flick that switch and instantly become firefighters. The biggest connection I had with the movie is that sense of awe at both the beauty of nature combined with its overwhelming destructive power. We get to see both up close – we walk through some of the most rugged, diverse and beautiful parts of our country and then get so close to the fires that we have to shield ourselves from their heat. There’s one scene in particular that resonates with me – after a hard day on the fireline, the crew are relaxing on a hill at night looking across to the opposite hill dotted with multiple fires. This is exactly what I saw in the Tidbinbilla Nature Reserve on the night of 17-18 January 2003. It almost sounds like a cliche, but we see in the movie how firefighting brings diverse people together. It might not be the drug addict with a criminal record as we see in the movie, but our fire services really do bring together women and men of every just about every background you can think of. Just as in the movie, once we have bonded we then tend to seek out each other’s company. I put this down to a shared experience which can really only be understood by an exclusive few. The way that the characters change their focus as they go to the fires is something very familiar to us. Private lives are put on hold and they start focussing on the fire – how big it is, where it is, the terrain and the weather – rehearsing their tactics and then refining them as the fire develops. To sum up, I think this is a movie for everyone to see. If you’re not a firefighter, its a good dramatic plot populated with multiple strong characters with their own personal stories. It’s not violent, so it’s something that all the family can see. It gives a deeper insight into what firefighting is like compared to the couple of seconds of footage on the news you may see during an Australian summer. If you are a firefighter, then there’s a lot that you can associate with and understand. It stands as a tribute to the Granite Mountain Hotshots and others like them who have died in the service of their communities.